Edwin Jackson is a pitcher everyone wants to acquire, but then seemingly can’t wait to unload as soon as possible. Or at least, that’s the impression you get from looking at his trade history. Jackson has been traded six times over the course of his career, with five of those trades happening within the last three years. He’s been traded for exciting prospects, not exciting prospects, an enigmatic center fielder, a powerful outfielder with platoon issues, and a multitude of relief pitchers. He’s 27-years-old and has yet to become a free agent, but he’s already been on seven different teams in his career. For comparison, Ricky Henderson — the prototypical man-of-many-hats — only played on nine different teams over the course of his entire career. The teams listed are the ones that acquired Jackson in a trade, and the players listed are the players that team gave up to acquire him. The trades are listed in chronological order, and I also included how much WAR Jackson produced at each stop along the way. This way, the chart can show you three things: what players a team gave up to acquire Jackson, how much he produced while with that team, and what that team got back in return for Jackson when they eventually traded him away. For example, you can see that the Rays acquired Jackson back in 2006 for Lance Carter and Danys Baez. He stuck around with them — producing 3.0 WAR in the process — until he was traded to the Tigers in 2008 for Matt Joyce. I’ll let the graphic stand by itself, expect for one final thought: the White Sox got plenty of production from Jackson while he was in Chicago, but man, those are two disappointing trades. They gave up much more to acquire him than they received in return, despite the fact that Jackson has only gotten better and better these past few years. That’s a job well done. 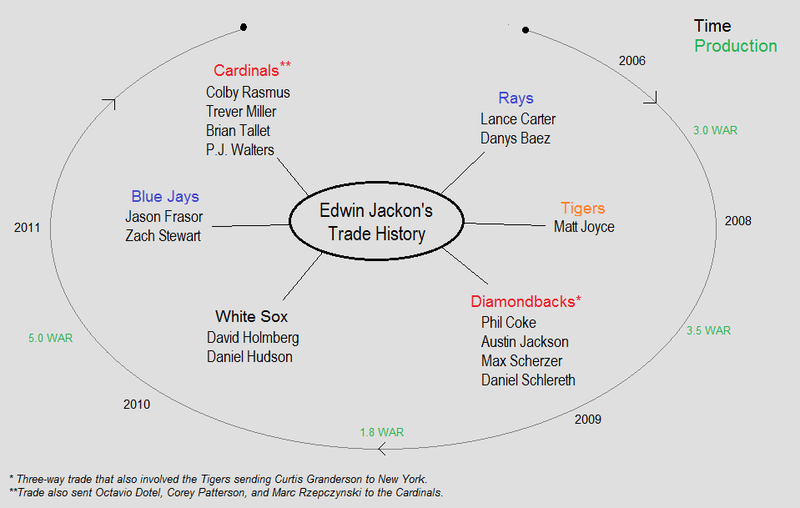 We hoped you liked reading Visualizing Edwin Jackson’s Trade History by Steve Slowinski! The baseball season hasn’t officially begun until Edwin Jackson gets traded.